Problem C14: Two speakers are producing sinusoidal sound coherently in phase. The speakers are separated by a distance of n1. The wavelength of the sound is n2. See the figure below. A person starts out at point A in the figure, which is far away from the speakers. 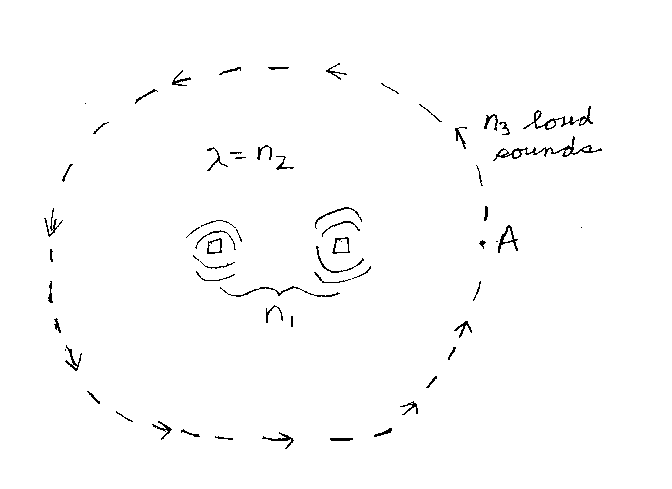 The person walks in a circle around the center of the speakers and returns to where he started. When he does this, the sound gets loud n3 times during the circular walk. what is n3? Note that n1 and n2 have the same units of length, and n3 is unitless.